Today, for eight straight hours, Dreamscape Foundation and Twitch Streamer SunsetWasTaken, are teaming up for another epic Charity Stream event! 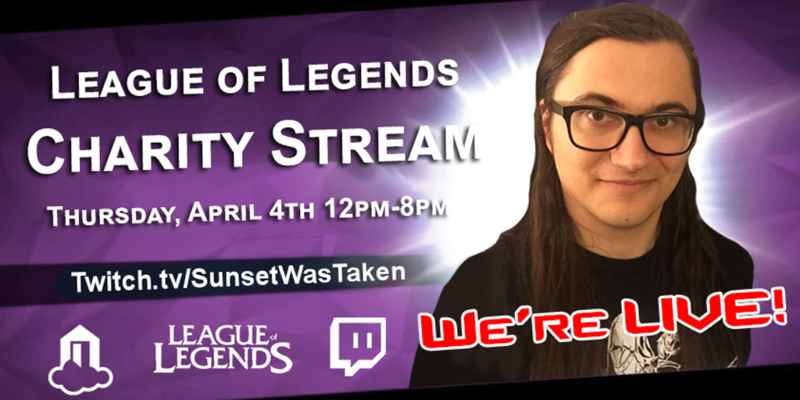 Come tune in to watch Sunset crush the competition in League of Legends. This Charity Stream is dedicated to raising funds for our accessibility programs; helping to provide many different tools and devices to those in need! Whether its screen reading software, E-sight eyewear, or accessible gym equipment, Dreamscape Foundation believes everyone deserves to live their life to the fullest. In our world, millions of people are held back and left unconfident due to a disability. But we believe everybody is unique in their own way and with their own abilities can overcome any disability! Though these Charity Stream events are fun, interactive, and give everyone who donates a chance to win amazing prizes; the real excitement comes from what we are able to do with the generous donations. To know you were a part of changing someone in need’s life for the better is a feeling you can never forget! The programs we fund and the people we sponsor are always so grateful for the love and generosity so many show. It truly is incredible to see the unity portrayed in Twitch’s online community during even the smallest events! We urge everyone, whether you can donate or not, to stop in at your leisure to check out what Sunset is up to! It is sure to be a thrilling event for all in attendance and at the end of the day, all we hope for is for everyone to have a good time! Hope to see you there!